I explain how a simple post on Facebook gives the first glimmer of the project. I also come back to a big source of inspiration: OuiShare, an international movement about collaborative economy, which was also born in France. I quoted Joel de Rosnay. His book Surfer la vie : Sur-Vivre dans une société fluide (Surfing Life: How sur-vive in a fluid society) helped me to understand our world and its evolution. All this has motivated me to develop these ideas and trends in research with Open Science. What does the word hacking mean ? In the TEDx, I especially explain what I mean by Hacking his PhD. 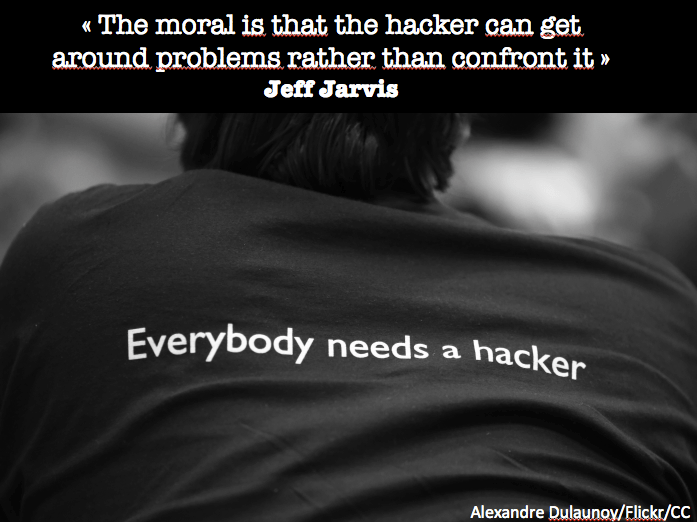 Indeed, people are sometimes skeptical of the term “hacking”. For me, it doesn’t mean to become a pirate or a terrorist in research. It means that we should find pragmatic solutions to existing problems. Sometimes, seeking other parallel paths can help to reach his goal. My inspiration comes from the documentary une contre histoire des internets (the anti-history of the internets). Jérémie ZImmerman and Jeff Jarvis. gave good explanations of what hacking means. A critical look at the research? After this TEDx, someone accused me of giving a very negative image of the research. Certainly, by sharing my personal experience, I tackle difficulties in research today. For those who are not familiar with TEDx, during a talk we tell our own story (storytelling) which gave life to the project. But the goal is not to make generalisations about my story. Each researcher has their own story and feeling. Those who know more about HackYourPhD are aware that the goal is not to destroy the current research. The aim is rather to show and develop the new initiatives emerging with OpenScience. The subtitle of the crowdfunding campaign HackYourPhD aux States summarizes what we seek with HackYourPhD. An open and dynamic research community exists, HackYourPhd invites you to discover it and show you that we all have a role to play! Critics are always welcome when their goal is to improve the project. So do not hesitate! You can activate the subtitles on YouTube. Thanks to Sabrina Palis, Eugenio Battaglia and Guillaume Dumas for the subtitles in english and french.